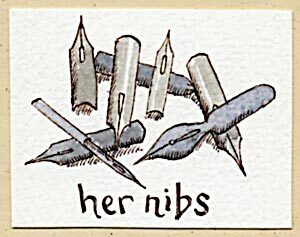 Firstly I have some follow on news from my previous blog ‘Pen Pals’. 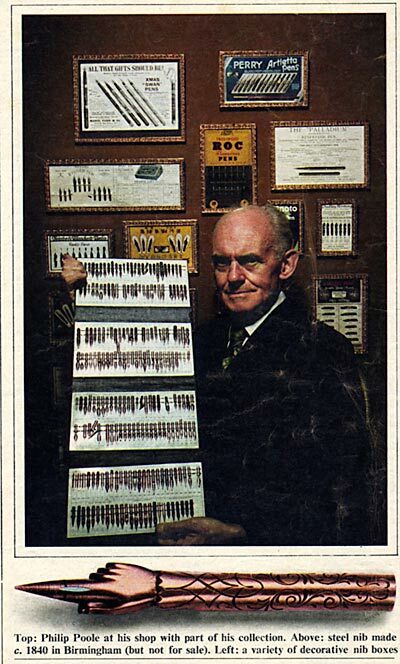 Thanks to my lovely pen pal Alan (whose work features in that blog) I have a picture of Phillip Poole, the man who sold me my mixed box of antique pen nibs. Alongside that I have a little picture drawn for me by my good friend and wonderful illustrator Stu McLellan. There’s a quiet pleasure in showing people that an original print has its own integrity: it is what it is and has as much validity and presence as any other art form. Anything I can do to convince people that we printers are skilled artists, not button pressers or poor relations of painters has to be a plus. Yes, it does mean I won’t manipulate or resize my work, or indeed reproduce a print in any other way than a greetings card, but that’s the way I like it and that’s the way my customers like it too! Along with Woman’s Weekly, I’m a great believer in hints and tips. I do love to experiment and I’m only too eager to share my findings with the world. Mostly my friends and family are not over interested in raising grain on wood, new papers or alum as a mordant, but there are a whole bunch of people out there who are. To that end I run a page on Facebook and if this sounds like a cheap ad then I’ll come clean, it is. Join me at Laura Boswell Printmaker and I’ll tell you all sorts of things which may come in handy with your printmaking. Not all artists feel the same about this. My favourite horror story came from a weekend student who had asked a technical question about the printmaking she was learning and was told by her artist-teacher that she ‘couldn’t expect to be handed everything on a plate’. I had a chat about this with a class of eleven year olds recently and was told in no uncertain terms ‘if you tell all your secrets Miss, then other people will do it too’. Fortunately for me there are fairly big odds stacked against me being replaced, whatever secrets I tell. I arrive at my images by a process which is a complete mystery to me. I have a feel for how I want things to look, nothing as clear as a mental picture, and I simply strike out in that direction. It’s not much of a road map and I’m fairly sure that other artists are way more interested in taking their own journey, not mine. The other issue is sheer hard boring work. A marathon runner can tell you what shoes to wear, which drinks to use, how to interval train, but it’s you who has to get out there and suffer the running. Printmaking is a hard, long, precise slog with many, many mistakes and disappointments before you get to the point where ‘it looks easy’ and that takes serious passion. Add to that the work of being self employed: the pitches, the marketing, the paperwork, the logistics of exhibitions, the rejections, the teaching prep etc. Frankly not many people will be up for that. Most people are sensibly happy to print as an adjunct to normal life and if they are in it for the long haul then, like me, they need all the help they can get. So, I’ll keep on being open and excited to share everything I do. Frankly if I help in making printmaker’s lives a bit easier then great, I’m proud to do that. I’ve been on the receiving end of enough brilliant advice in my time to be only too happy to pass some along. How I price my prints. When it comes to my prints, I feel pretty much the same as Quentin Crisp: ‘there’s no greater sign of love than somebody prepared to pay money’. He may have other things in mind, but it’s a valid thought. I know we are, as artists, supposed to live for higher things than cash (which would be nice if we could also be spared boring details like broken boilers, council tax and the need to eat), but the fact a stranger can be so delighted by the way I have arranged ink on paper that they’ll happily give me their money does tend to do it for me. Pricing art is a really difficult one; there are all sorts of methods out there ranging from complicated algorithms to a price per inch guide for painters. I try to keep my work at a price that reflects the size of the work and the complexity of production, while remaining affordable. Gauging the affordable bit I do in food: the price of a curry, pizza and coke for the family, anniversary meal, anniversary meal when you’ve forgotten the anniversary etc. The public don’t always see it that way: nearly every artist has a show story where their prices have been questioned by Joe Public only too happy to blow almost the same amount in lunch, beer and ice cream in the next tent (not that we’re bitter…). So, having decided on keeping my prices affordable, the other hurdle is the difference between selling work myself and selling it through galleries who, in my opinion, quite reasonably want their cut. After some trial and error I’ve decided there’s only one sensible solution for me. If a picture costs a curry for four with a couple of pints of Kingfisher each and an unnecessary kulfi, then that’s what I’ll be asking if you buy from me, the internet or in a gallery. So there you have it, one artist’s view on pricing. It may be simplistic and I may not reap huge rewards as a consequence, but it keeps things fair and me able to sleep. I’ll shortly be adding prices to my prints on the web site (at the moment you have to mail me to ask) and you can do your own conversions – motorbike parts maybe or tickets to assorted Olympic events?